IRELAND HAS MADE mistakes in putting together its tax system in the past – and the country needs to learn from those failures, Michael Noonan says. But the finance minister also said the country had been unfairly “caught in the crossfire” of sniping between the European Union and US multinationals when it came to corporate tax avoidance. Noonan today told a tax conference, put on by the Institute of International and European Affairs (IIEA) and KPMG, that it was “no coincidence” most European Commission state-aid investigations – like the outstanding probe into Ireland’s claimed “sweetheart” deal with Apple - had been targeted at American companies. “It is not right or fair in my view that only US companies should be targeted in the international debate on the appropriateness of global tax laws,” he said. He said Ireland “like many others” had made mistakes in setting up its tax system, for example in property-related breaks which were “allowed to continue for too long with no rationale behind their maintenance”. “The lessons learned must also be born in mind when determining our international tax strategy,” he said. In this year’s Budget, Noonan announced he was closing the much-criticised loophole which allowed multinationals to shift their profits offshore by setting up Irish-registered companies with tax bases elsewhere. He added that the Apple state-aid case against Ireland was “weak” and added that the country would use “every legal avenue open to defend our position” if the commission ruled against the government. But he said the country welcomed the OECD’s Base Erosion and Profit Shifting (BEPS) plan, designed to address multinationals’ international tax avoidance measures, as long as it created a level playing field for everyone. “EPS must not be about advantaging big countries over small countries and, equally, it must not be used to single out US multinational entities,” he said. 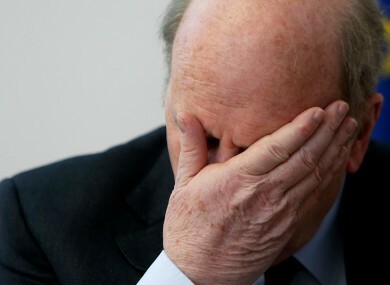 Email “'We have made mistakes in the past' - Michael Noonan talks taxes”. Feedback on “'We have made mistakes in the past' - Michael Noonan talks taxes”.